Crispy Cheese and Refried Bean Quesadillas that can be easily tailored for almost every diet restriction and budget. It’s summer and you may not be thinking too much about food you can make when living on your own in the fall. However, now is a great time to start gathering ideas. When my friends and I first lived on our own, the trend was to reduce eating meat-based meals. Not necessarily because of diet, but because meat is expensive to buy. Without meat in the picture, a meat-eater like myself found it difficult to come up with meal ideas. There’s room for everyone to enjoy a quesadilla. Whip up this cheese and refried bean version as a meatless quesadilla. Or add leftover taco meat, thinly sliced steak or shredded chicken for a meaty version. Quesadillas are equally as versatile to cook. Heat them in the microwave when you need to eat and run, or take a few extra minutes to crisp the tortilla to perfection in the skillet! Top with sour cream, salsa, and chopped green onions. It’s a delicious, time-friendly meal that will keep you on track with whatever diet (or food budget) you follow – in 15 minutes or less. I included plenty of versatile and easy meal options in 15-Minute Money Saving Meals for Students: – a digital cookbook for when you just want to tap your phone or swipe your tablet for recipes that can be made as quickly and these Cheese and Refried Bean Quesadillas. Take a peek HERE for the details or join us in the weekly updates and get a free five recipe sample from the book. To make filling, mix together refried beans, enchilada sauce, sour cream, salsa and chili powder in a bowl. Stir in corn. Spread equal amounts of filling mixture over each flour tortilla. Top each with equal amounts of cheese. Fold each tortilla over filling. MICROWAVE METHOD: Place one or two cheese and bean filled flour tortillas on a microwave safe plate. Microwave until cheese inside has melted and ingredients are heated through, about 1 minute. FRYING METHOD: Lightly brush both sides of each cheese and bean filled flour tortilla with canola oil. Lightly brush the surface of a non-stick skillet with cooking oil, using a basting brush, and heat over medium heat. Place filled tortilla on skillet. Cook until outside of tortilla is crisp and golden brown, about 1 to 2 minutes. Flip with a spatula to crisp and brown the other side, about 1 to 2 minutes. Allow quesadillas a few minutes to cool before cutting into bite-sized triangle pieces. Top with extra sour cream, salsa and chopped green onions. Dig-in! Love It? Share It! Thanks! 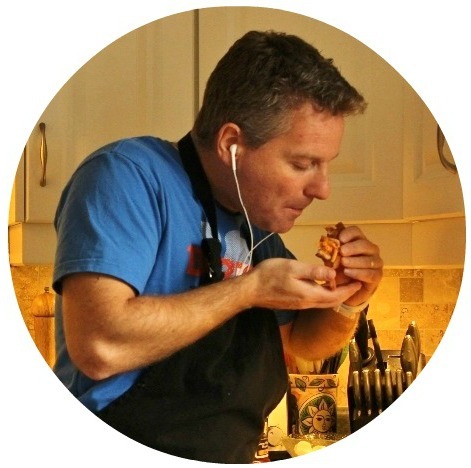 Brent Garell – Brent is the guy behind College Recipe Cafe, and author of The Cook-a-Palooza Experience. He visits local colleges to teach students cooking 101 skills, and is the author of the digital cookbook 15-Minute Money Saving Meals for Students: Cup of Recipes for When You Need Food NOW! Available now on Amazon.